so I wanted to share some pillows my sister made for me for Christmas. this adorable bird on a branch to just make it over the top cute! actually they are still there cause I'm really lovin' em. oh yeah, she's a brave one. She's sneaking a sniff of the magical mystical burlap perfume. Your kitty is just too cute! Those pillows are so pretty. That sure was nice for your sister to make them for you. I think they can be used year round. Debra I LOVE those pillows!! Your dining room table always looks AMAZING!! Lucky you ~ adorable pillows! But kitty is just THE most adorable thing on your post today!! Happy 2012! I love that bird silhouette pillow! What a nice gift! Debra, the plaid pillows are adorable! The little bird added just the right touch! I absolutely love those plaid pillows! Your dining room looks wonderful, especially with the burlap and kitty! Durn cats, they jump into a photo all the time! I am in need of new pillows all over my house, and these are "sew" clever with the bright white silhouettes. What a lovely personalized gift! I'm new to your blog. Your home is beautiful and I love the plaid pillows! They loook wonderful in your dining room. What a sweet kitty! Mine always has to be in a photo, too. I'm off to take a look at your Valentine's necklaces! I made silhouette pillows for my friend's new house--the profile of Sherlock Holmes! Love the pillows, but what really caught my eye was the cat sniffing the burlap, way tooo cute! Love the pillows! Red plaid is a perfect print for this time of year. Your Paperwhites really are pretty. I regret not doing any this year! Your sis did an awesome job on the pillows...LOVE the little birdie!!! What a lovely gift from your sister, Debra-they fits perfectly in your beautiful room- and your Paperwhites looks so lovely. Sniffing burlap and soaking in the sun's rays...ah~h~h the life of a feline! Ha! Too cute! Your pillows are stunning, indeed. Having the paperwhites bloom now helps to fill the void often left behind after the Christmas decor is put away. The dining room centerpiece is divine! Have a wonderful week ahead! The plaid pillows are remarkable. As hard as I try not to covet, I'm not doing so well :) And the paperwhites en masse~ splendid. LOVE IT ALL. 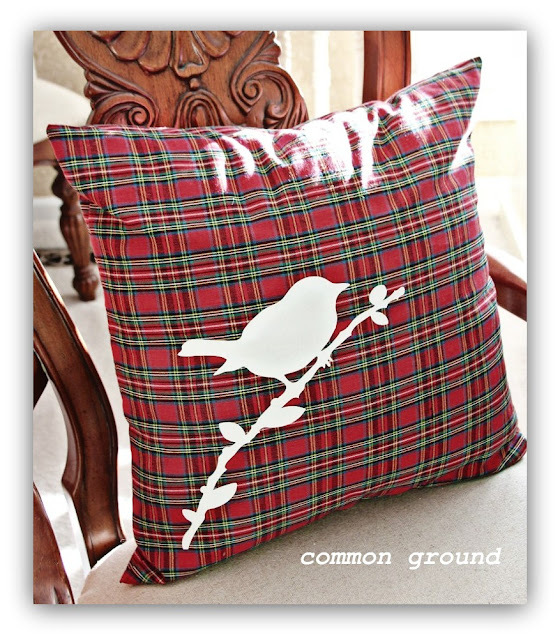 I love anything plaid, and those pillows are great!! 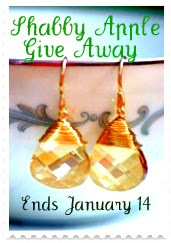 We're having a give-away too. It's for a $50 gift card to The Container Store. Come give it a go. Haha, I knew kitty would end up on that table. The pillows that your sis made have you all over them don't they? Those are darling! I love plaid too. I think I better start incorporating it into my Christmas decor next year! :) It's just around the corner you know. :) I also love that beautiful fern basket on your dining room table. Stunning! Debra, I LOVE plaid! I so wanted to do an all plaid Christmas this year but I just couldn't get it together. Your pillows are wonderful...love them! Your sister did a fantastic job! Does she have a Etsy shop? Those would def sell on Etsy! Love Miss Kitty, too! Wonder if burlap smell is a bit like catnip? lol I'll have to test my Max cat out on some burlap and see what he thinks about it.